Himalayan Salt is extracted from the Khewra salt mines in Pakistan. It is a task accomplished purely by hands with the help of many laborers who work tirelessly every day. Not only do they extract coarse grain salt, they also carve out large chunks of salt as well. When they carve out a hole in these salt chunks and place a lamp inside them that is essentially what a Himalayan salt lamp is. Not only does it increases the aesthetic value of a room because of its exotic look, it also has other merits to it. For example, a lot of research has gone into the possible health benefits we can reap from a Himalayan salt lamp. The good news is that there are quite a few pleasant changes that a Himalayan salt lamp can bring to your health, but remember that none of these benefits are too massive. But sometimes, small positive changes is all what we are looking for. One of the most dominant properties of a salt lamp is that it is hygroscopic. This means that it attracts water molecules in the air towards itself. If you have ever come across a salt lamp, you must have noticed that it starts “sweating” when you place it in a humid area. The droplets of water in the air are contaminated by a number of pollutants which also find their way to the salt lamp. This is how it lessens some of the pollution in the air. A Himalayan salt lamp is also great for deodorizing the air. Bad smells are caused by smelly particles in the air. The hygroscopic property of the salt lamp attracts these smelly particles along with water droplets towards itself. This keeps the air in your surroundings smelling fresh and clean. Using a salt lamp for deodorizing purpose is great for people who want to get rid of bad smells without using any other artificial fragrances to counter it. The pollutants in the air can find their way to your lungs and induce a number of problems in your respiratory system like coughing, sneezing, sinus blockage, etc. This is where the salt lamp comes to your rescue and take some of these particles to itself and keep your airway clear for you. The irritants in your airways eventually find their way to your lungs, some of these irritants are infested with disease-causing bacteria and can prove to be very detrimental to your health. Salt lamps are bactericidal, so they can kill bacteria which resides in these irritants and it also keeps these irritants out of your lungs. Air that is contaminated with irritants and pollutants is an absolute nightmare for asthmatic people. They can get fits of coughing or wheezing if the air around them gets too polluted. A salt lamp can be a perfect gift for such people, because it will ensure that they can breathe in fresh and unpolluted air. Irritants in the air can induce symptoms of allergy in your skin and respiratory system. Allergens in the air can make you cough uncontrollably or cause skin diseases like eczema as well. A salt lamp can be the perfect healing agent in such cases because it will attract all these allergens towards itself. Another great merit of Himalayan salt lamp is that it neutralizes electromagnetic radiations in the air. Our air is mostly full of positive ions that are emitted by the screens of our phones and televisions, along with the white lights that we have adorned our homes with. These positive ions can induce a lot of health problems like anxiety, agitation, fatigue, and stress. Himalayan salt lamps, on the other hand, release negative ions in the air which can improve your mood and boost up your energy levels. 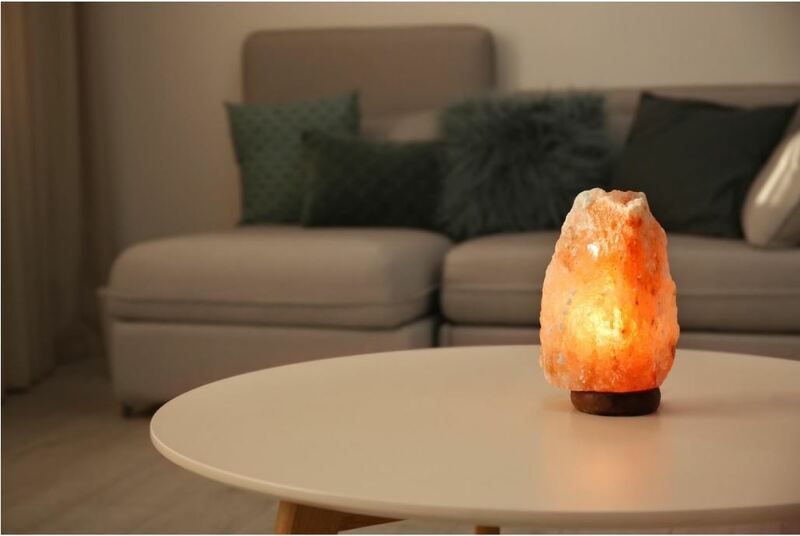 Even if you cannot be in an environment of purely negative ions, at least some of the positive ions will be neutralized and their harmful effects will be nullified by these salt lamps. If you sit near a salt lamp and take in its warm glow, you will automatically start feeling calmer and more serene . It is believed that the negative ions released by the lamps are responsible for this positive effect on the mood. Studies have been conducted on people with depression and they have shown a very positive response for being in an environment surrounded with negative ions. This is why people believe that adorning the house with salt lamps is actually beneficial for depression and anxiety. The white light and positive ions surrounding us all the time also cause a significant amount of stress on our minds. Lighting the room with a couple of salt lamps will really help you in relieving some of that stress. Looking at screens all the time can cause fatigue. Salt lamps can combat some of the fatigue and make you somewhat energetic again. This might sound like a bit of a stretch but there are studies that have linked clinical white and blue light from screens and LEDs to the inefficient working of the immune system. The impact from a couple of salt lamps will be small but effective in improving your immune system. Salt lamps, with their warm glow, make an excellent nightlight which can induce a peaceful and restful sleep. Blue light also causes agitation and distraction. Warm light from a salt lamp will help you out in improving your focus on your work. The warm, orange glow from a salt lamp is much better for the eyes than the clinical lights we are used to. Your eyes will feel much more relaxed by the warm glow of salt lamps. Hey there, friends! I’m Jeffrey. I’m a blogger at ittefaqco.com. Thank you for joining me, as I share different aspects of my life. I’m so thrilled you stopped by! I love to create a beautiful, thriving life around me and helping others to do the same. I love writing about nature, health, Himalayan salt and home décor related topics.